For WORKac’s Amale Andraos and Dan Wood, “Urban farming became a way of talking about the sustainable city.” This long-time interest led them to chef Alice Waters and her Chez Panisse Foundation, and in 2011, the two teamed up with P.S. 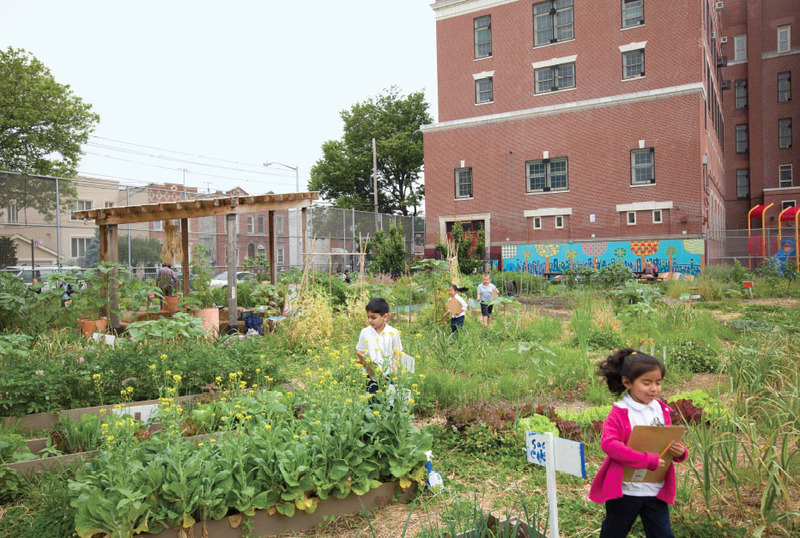 216 in Brooklyn to design the first of Waters’ Edible Schoolyards on the East Coast, an organic garden that is wholly integrated into the school’s curriculum and food program. The design includes a Kitchen Classroom where students can prepare and eat meals together, a greenhouse roof that creates growing space in the winter and retracts in the summer, water reclamation, and composting. For the project’s design coup de grâce, all of the components are interlinked to form an off-grid, self-sustaining system.